With The Gaslight Anthem now on an indefinite hiatus after wrapping their last tour earlier this year, frontman Brian Fallon has already hit the studio to record a solo album. 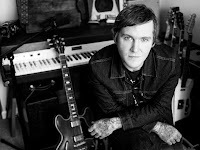 The album, titled Painkillers, is being recorded in Nashville with singer-songwriter and producer Butch Walker and is expected to hit stores in early 2016, likely before he hits the road for his newly announced east coast tour. Fallon and the Crowes will play the Haw River Ballroom in Saxapahaw on Saturday, January 16. Tickets are on sale now via Ticketfly for $25. Check out Fallon's full set from the Newport Folk Festival earlier this year below.